If you’re looking for new seamless gutters for your home in or near Rio Rancho, New Mexico, then call on the home renovation specialists at ABC Seamless of Albuquerque. We have faithfully served residents of the region since 1989, installing top-quality gutters that provide unsurpassed protection when the skies open up and torrential rains fall, as well as other extraordinary home improvement products designed to give your home the ultimate in protection from the elements. Our seamless gutters are fabricated on site, using the precise measurements of your Rio Rancho home. 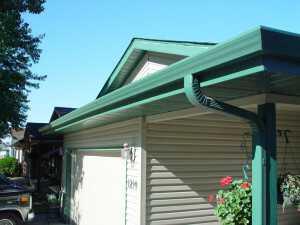 The result is a gutter system that stretches flawlessly from corner to corner for a perfect fit. By eliminating the seams, we also eliminate the most common issue that arises with lesser-quality gutter systems – leaks. Our seamless gutters channel water directly to the downspouts, where it will be directed away from your home’s foundation and seep harmlessly into the ground. Leaky gutters allow water to drip along your home’s foundation, where it can create all kinds of damage and result in costly repairs. To learn more about our amazing seamless gutters and other home protection products, contact ABC Seamless of Albuquerque today. We’re proud to serve residents of Rio Rancho, NM, and all surrounding communities.